Many of you may know that in addition to Simply Delicious Living, and writing novels, I work as a lifestyle reporter. One of my beats is reporting environmental news (for print & TV). For this Sustainable Ventura News segment (BELOW), which focuses on holiday food waste prevention, I worked with City of Ventura Environmental News Specialist Tobie Mitchell. Tobie cooked up a fun recipe I developed from holiday leftovers adding in a few ingredients of her own (leftover kale and grains). 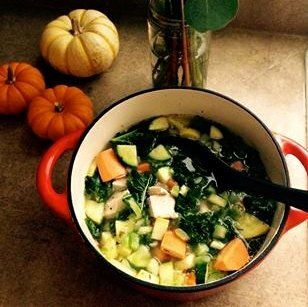 The result — a simply delicious, hearty and nutritious soup that you can enjoy for lunch, dinner or a healthy snack! (Note: For a vegetarian “Green Stew” use vegetable stock and forgo the meat). Drizzle extra virgin olive oil in a skillet over low heat on the stovetop and add in onions and garlic, celery, and carrots and sauté until slightly golden. Place the broth, meat, other vegetables, and celery and onion mix, 2 bay leafs, Italian seasonings, and a few dashes of salt and pepper in a large pot*. Bring to a boil and simmer about 1.5 hours or so. If adding prepared rice, noodles, and/or leafy vegetables, add these for the last 15 minutes of cooking. Taste the soup and see if it might need more seasoning. For a little “kick” add in a dash of red chili pepper flakes to taste. *To cook this stew in the slow cooker, combine ingredients in step 2 and cook on HIGH for three hours. Proceed with the remaining steps.